I really love this. Now, I just have to remember how to diagram a sentence. Messy offices and desks are something that many of us have problems with. Over the years my office has gone through cycles ranging from minor embarrassment to total disaster. Occasionally, when I have had enough of the mess, I try to organize things, but soon piles of paper build up, staking their claim to my desk. Chaos occurs because I don’t have a system to deal with daily organization. Paper is my biggest problem, so I decided to tackle it first. Dealing with paper should be an easy thing, but problems occur when an item doesn’t neatly fall into one of my pre-existing folders. Sometimes I’ll create a new folder if I feel that it warrants one, but often times it just gets put into a pile to be sorted later. Instead of getting sorted out, the pile soon grows and grows. I decided to attack the problem directly by trying to go paperless. My tool of choice for this is the ScanSnap- Evernote Edition Scanner. This scanner is the special branded Evernote edition of the Fujitsu ScanSnap iX500 Scanner . The software for the regular iX500 is more versatile and has a few more features than the Evernote edition, but the workflow with Evernote is what appealed to me most. The Evernote edition is designed to automatically scan in documents, business cards, photos, and receipts into Evernote. I have used Evernote daily to store little bits of information and clipped web pages, so managing scanned documents seemed pretty natural. The ScanSnap- Evernote Edition comes with one year of Evernote Premium- you’ll definitely need managing this amount of data. Now, as soon as something new comes across my desk, I deal with it immediately, deciding if it’s worth scanning or not. 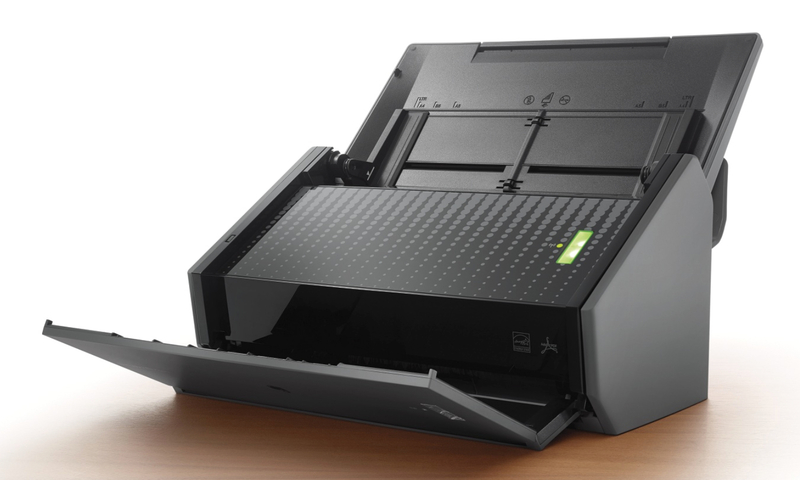 The ScanSnap is a duplex scanner, able to quickly scan both sides of a document at once. Multipage documents placed into the document feeder are scanned as quickly as they can be pulled in. Unless it’s an important document where I need to keep the original, it gets tossed in the shredder. Scanned items show up in Evernote in various notebooks that you can set. From there you can label the items and file them into other notebooks. You can have the same problem as physical filing, the proliferation of notebooks but it is a lot easier and quicker to create virtual ones. But if you have too many of them it’s a little bit awkward dragging and dropping documents to the correct notebook. One of the big benefits of filing things digitally is that instead of being buried in a physical folder, each document that is scanned into Evernote becomes searchable. I don’t know how many times I’ve found information that would be impossible to find if I had to go to the file cabinet. Documents are no longer just documents, but useable information. There are a few little quirks in the workflow. The ScanSnap- Evernote Edition uses size to automatically differentiate between business cards, receipts, and documents. If you have two different documents, you must scan them individually or they end up in one file. If you have different sized items, you have to set it manually to document to get everything to scan into one document. Sometimes things are scanned in and are upside down and need to be manually rotated. You would think with Evernote’s automatic OCR that it would take care of it 100% of the time. It doesn’t. Note: There is a video on the Evernote site that shows a bunch of papers, photos, receipts, and business cards sitting in the document feed being scanned in and automatically sorted. I think it is somewhat misleading, because Evernote can not sort between two different documents, any letter sized documents that are together gets scanned into the same document. Evernote suggests putting a business card between each letter sized document to break things into separate documents. In reality this not very practical. I have gotten used to scanning things in one at a time and this works fine for me. The ScanSnap- Evernote Edition at $495 is a little pricier than other scanners, but to me it has been worth every penny. The ScanSnap can be found in Evernote Market. The Omega J8006 Nutrition Center Juicer – Black and Chrome is on sale at Amazon for $206.99. This is a great deal for a great juicer. It’s a masticating juicer where an auger basically presses the juice out. I’ve had this juicer for over a year and it’s great for juicing greens like Kale. It’ll take pretty much anything except for really soft items like berries. Update: Sale is currently over and the price is back to $267.97. If you can get the Omega J8006 around $200 it’s a really good deal for a very good juicer. In November of last year I upgraded my laptop to a new Macbook Pro Retna 15″ from the first generation Macbook Pro from 2006. The new Macbook Pro feels the same in all the good ways which is a testament to Apple’s design abilities. 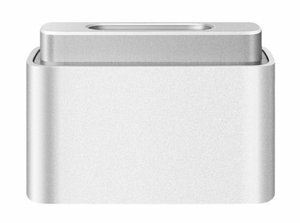 One thing that has changed is the shape of the MagSafe connector that connects the power supply to the computer. When I got my new Macbook Pro, the old one got boxed along with its power supply because it wasn’t compatible. Last week I forgot to bring my power supply to work so I thought about running out to get a new one just to have one at the office, but then I discovered this: the MagSafe to MagSafe 2 Converter . This adapter is quite magnified in this picture. The actual adapter is about the size of a penny. This adapter magnetically clips on to the MagSafe old power supply and changes the shape to be compatible with the new Macbook Pros. It’s works great and it’s perfect for me since I think I had at least two of the old adapters around from the seven years I had my old Macbook Pro. Now, it’ll save me the time and trouble of unplugging my power supply from home and bringing it to work. I purchased a new Apple MacBook Pro 15.4-Inch Laptop with Retina Display late last year , to replace my EIGHT year old Macbook Pro 1,1. After using the new one for several months, I don’t know how I managed to tolerate using the old one for so long. Everything on my new Macbook Pro just flies. Well, almost everything. Mail for OS X Mavericks always seems sluggish. For an app that I spend way too much time in, it’s frustrating to have to wait for it to keep up with simple things like replying to an email. Disabling animations helps a little. I downloaded this plugin that disable’s Mail animations and now Mail now feels a tad bit quicker. I hope Apple gets to working on making Mail more responsive in future updates. Update: July 8, 2014 Apple has released 10.9.4 which updates Mail to 7.3. Plugin has also been updated. 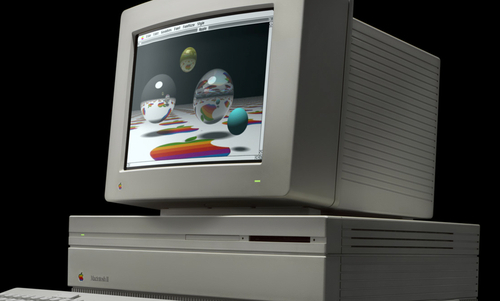 Apple has created a page celebrating 30 years of the Macintosh. Beautiful photographs of Macs in the way that only Apple can do. My first Mac was the Macintosh II shown above with only one floppy drive. No hard drive! To run a program like Microsoft Word, I had to alternate between the system disk and the Microsoft Word program disk. Lots of ejecting and inserting. It’s crazy to think about that now. 2CELLOS Luka Sulic and Stjepan Hauser performing their arrangement of Every Teardrop Is a Waterfall by Coldplay on 1 cello! They’re making their debut with the Kentucky Symphony Orchestra this Saturday, November 2 at Florence Baptist Church at Mt. Zion. Get your tickets here. After seeing this video, I’m buying my tickets now! My future travel destination list just got a lot longer! A hamburger made from cow muscle grown in a laboratory was fried, served and eaten in London on Monday in an odd demonstration of one view of the future of food. I understand the driving force behind this. Meat production today takes a great deal of resources. If a way is developed to cheaply produce meat with a smaller environmental footprint, more people can have meat more often. The science is interesting- this is one step closer to the food replicators in Star Trek. But, the main question that I have is about the quality of the meat and could we ever trust the people or companies that grew it. Existing processed foods are full of ingredients that are added not because they are good for you, but change the appearance, make it cheaper, or last longer. I can see this happening with cultured meat. Maybe snake meat cells replicate more quickly- what is stopping manufacturers from adding it to the mix? Companies already do not want to tell us if their product contains GMO’s. I definitely wouldn’t trust the companies to tell us how meat is grown. While the line looks simple on TV, the technology behind it is very complex. Sensors were placed on the three main game cameras (at midfield and the two 20 yard lines), capturing the pan, tilt and zoom movements of those cameras 30 times a second. A three-dimensional, virtual model of each field had to be constructed, with the exact measurements of the crown of the field (the center of the field is always higher, for drainage, than the sides and ends, but the precise levels vary in each venue). An exhaustive color palette had to be produced on the fly as the game progressed, so that the green pixels of grass the yellow line replaced would be exactly the “right greens” even as shadows crossed the field and changed the grass hues — an essential feature to assure replacing only the green blades of grass and not the green threads of a Packers or Eagles jersey. I’ve wondered at how this was done and it’s a lot more complicated than what I thought. The addition of this line really did revolutionize the watching experience.